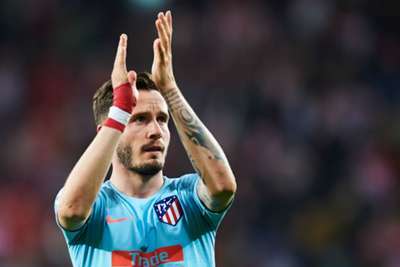 Atletico Madrid striker Alvaro Morata is not surprised by reports linking Saul Niguez with Manchester City, while he expects Antoine Griezmann to remain at the Wanda Metropolitano. Transfer speculation began to circulate on Wednesday suggesting City have moved ahead of Barcelona in the chase for Saul. The 24-year-old has become a key player for Atletico, with the midfielder's wide-ranging abilities earning him many admirers. Reports claim City are likely to have to shell out at least €80million to get the Spain international, with Morata insisting all the top clubs would "love" to sign his compatriot. "That's how the transfer market works, the best players are always linked with the top clubs in every transfer window," Morata told reporters while on international duty. We're back to work without our internationals! "Saul is one of the best players in his position and, on top of that, he's still young. We hope he stays, but all of the top clubs would love to have him in their squads." Griezmann is another of Morata's club colleagues being linked with a move, with media speculation in recent days again suggesting Barcelona want the Frenchman. The attacker rejected Barca in favour of staying at Atletico last year, and while the latest rumours claim he is considering leaving again, Morata thinks Griezmann will stay put. "I am not worried [about Griezmann]," Morata added. "Except last week when we were very upset [due to Champions League elimination], I've seen Antoine very happy with us. I think this is his home and he is happy here. "Sincerely, I think he [Griezmann] is at home, he is our most important player, our key player. Everybody in the club wants him to stay with us because he is our reference player."